The year has come around full circle once again as MTV presents one of the hottest award shows in music award history. The 2011 MTV Video Music Awards was held at the Nokia Theatre in Los Angeles, California for the second year in the row as it was a complete success last year, why change a good thing? One of the most spectacular shows in history, full of explosive stage performances and many artists available for ‘spicy’ statements that will keep us busy for a long time. Head below for our assessment of the six highlights from MTV’s big night. Let’s checkout this year winners and some of the highlights from MTV’s big night. Just a couple weeks after the latest maintenance release 4.1.2 of Oracle Virtualbox on the middle of August, fixing lots of stuff in the popular desktop virtualization platform, Oracle today release the long awaited new version of Oracle VM, version 3.0. 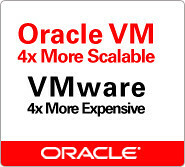 While Oracle Virtualbox enables desktop or laptop computers to simultaneously run multiple operating systems, allowing users to get the most flexibility and utilization out of their PCs, Oracle VM provides a professional server virtualization and management solution. As companies focus on delivering complete solutions, virtualization can help them transform the datacenter—moving beyond server consolidation to improving application deployment and management.